In the middle of the city, in the middle of nowhere, the smell of freshwater hand-reared sausage and newly laid home-kept chickens’ eggs calls to the empty stomach. 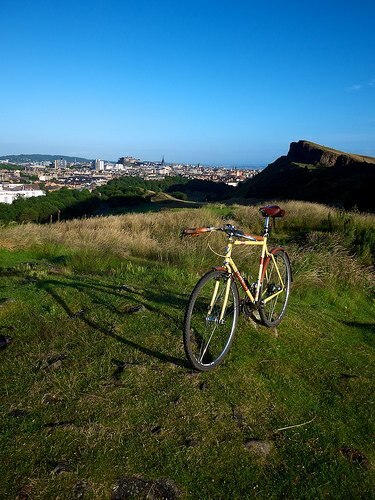 Not exactly a ‘route’, but I thought it would be nice to post a couple of shots from the last time CityCyclingEdinburgh (well, just Anth) did breakfast on Arthur’s Seat. This is about a five minute detour relative to the typical rush hour urban battle but you might as well be miles away from civilisation. There are nettles and everything! The only fly in the ointment is having to deal with the speedophiles rat-running through the park road when you ride away (a cycle path is available, but narrow and shared with many on foot- best left for the uphill direction). Attendance was low despite fantastic weather. 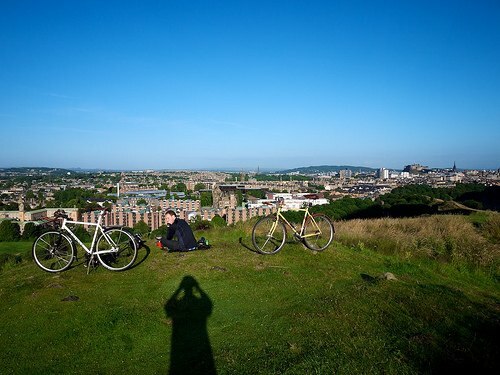 However, this did give me a chance to snap a couple of “reader’s bikes” against the iconic skyline of Edinburgh…. Can you tell me please, what kind of bike is the white one on these pictures. 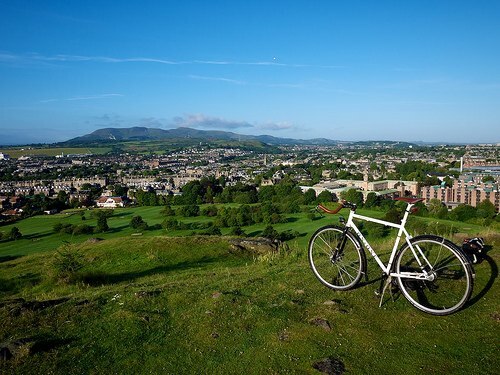 I think, this is the bike i am looking for..
It’s an On-One Pompetamix, built up with a SA drum/dynamo front hub and a SRAM Automatix on the rear.